The Central Information Commission has posed this question to the Archaeological Survey of India , the Culture Ministry, the Andhra Pradesh government and the shrine of Tirumala Tirupati Devasthanams. 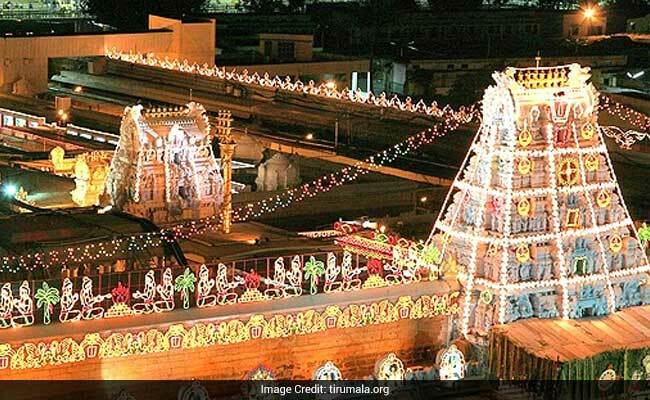 Where are the ornaments donated by 16th century Vijayanagara ruler Sri Krishna Devaraya to the Lord Venkateswara temple in Tirupati, the CIC has asked. The Central Information Commission (CIC) has posed this question to the Archaeological Survey of India (ASI), the Culture Ministry, the Andhra Pradesh government and the shrine of Tirumala Tirupati Devasthanams (TTD). Information Commissioner Sridhar Acharyulu in a stern order also asked the Prime Minister's Office to make public the action contemplated by the Union government to declare Tirumala temples as national monuments and to enforce international obligation to protect the world heritage structures and ornaments. The commission was hearing the plea of one BKSR Ayyangar who had sought to know from the Prime Minister's Office the action taken by the government on his representation for declaration of TTD Tirumala Temples as historical and as national heritage monuments. The query was transferred to various authorities but no satisfactory response was provided to Mr Ayyangar who then approached the commission, highest appellate authority in the RTI matters, seeking directions for disclosure in the matter. During the hearing he alleged TTD, a trust body, was not protecting the 1500-year-old structures in Tirupati as it shelved a 2011 proposal to declare the temple and temples around as ancient monuments under the provisions of Ancient Monument and Archaeological Sites and Remains Act, 1958. Citing a report of Director of Archaeology and Museums, Hyderabad in 2011, the information commissioner pointed out a 20-member team had found that inscriptions engraved on the walls of the Lord Venkateshvara Temple at Tirumala mention ornaments donated by Vijayanagara King Sri Krishna Devaraya. The report, however, says "no ornament" with the temple tallied with any of those donated by the king, the commissioner noted. "It is not a wild allegation of the appellant, but a major finding by the director of the Ministry of Culture, which was not acted upon since 2011," he said. Mr Acharylu said the TTD had appointed a self-appraisal committee under former Supreme Court justices DP Wadhwa and Justice Jagannadha Rao. The panel also noted the 'Tiruvabharanam' register, being maintained in Tirumala temple since 1952, had no mention of any temple ornaments received from Vijayanagara emperor Sri Krishna Devaraya and concluded all the items were intact, he said. "The report pointed out that there was no register for the ornaments in the temple before 1952, except the information of handing over the jewels by a priest in 1939," he noted. He said it was not known whether all valuable ornaments were recorded in any document and what kind of system was followed to document all old and new valuable ornaments, he said. The team had also recommended surprise verifications of ornaments and valuables by a special team and also by a team of 'archakas' of the main deity as others are not allowed to enter sanctum sanctorum, he said. Mr Acharyulu said the TTD had not published any action taken report on the recommendations of the Justice Wadhwa committee report. While hearing the 2009 PIL, the Andhra Pradesh High Court had wondered why the temple administration was reluctant to make a comprehensive inventory of the jewellery, he said. The petitioner, Mr Ayyangar, also alleged Veyi Kalla Mandapam (Thousand pillared 'Mandapam') in front of 'Mahadwaram' (main entrance of Lord Venkateswara Temple, Tirumala) built by 15th century king Saluva Malladevera Maharaj was demolished by TTD in 2003 without any reason. He claimed Mandapam was used to offer quiet space for pilgrims to sit, relax, and chant the name of the God in front of the Mahadwaram, read the inscriptions on the stone walls of temples and enjoy the sculptures on the pillars. "He believed that if Tirmala temples been declared ancient monuments, TTD could not have dared to pull it down," Mr Acharyulu sad. He said TTD was answering RTI questions earlier, but now refusing to respond, though part of endowment department of AP which is undoubtedly a public authority. "Justice Wadhwa and Justice Jagannadha Rao Committee reports are not made public so far. Why? They recommended for 'transparent and foolproof system for the protection of jewels'. What is the response on this recommendation," he asked. He said the Ministry of Culture and its Department of Archaeology have a duty to protect national monuments and ornaments of Vijayanagara empire. "The ministry under the leadership of the PMO is expected to take all measures to ensure the protection of the national or world heritage coupled with the ancient Hindu Religious Organisation like TTD," he said. He said it is the duty of Ministry of Culture and Department of Archaeology of Union of India to coordinate with the state bodies to know what exactly happened and assure the people that ancient monuments would be protected. "The PMO needs to understand that it was not simple question of weeding out a representation of appellant, but taking up concrete measures for securing the monuments of glorious cultural past of India reflected in Tirumala temples and diamond studded golden ornaments of olden times, without leaving it to the sweet will of political bosses of TTD," he said.